When I think about futuristic dystopias and retrowave, the first thing that comes to mind is the aesthetics. Neons and mist in dark alleys, dashboards and screens computing lines of code. Vibrant colors and scraped shapes and materials that, when assembled together, become an object with unclear balance between its form and function. During the design phase of the Laser GMK keycap set project, me and GMK began experimenting, testing and prototyping with colors, materials and unorthodox techniques in order to create together something truly unique for the keycap set. Our goal was to develop a product that would resemble manufacturing standpoints from a cyberpunk future. We wanted to celebrate the idea of not caring too much about the outside, so long the inside is functional. Hiding its thermal-alloy endoskeleton is almost like an afterthought. Covering its structure with translucent material is not only cost saving, but also makes easier to verify if the internals are hanging tough. Easier to repair and cheaper to maintain, after all. Like a futuristic industrial artificial intelligence being – it doesn’t matter if it has human-like eyes or a beautiful organically textured skin, as long as it routinely keeps performing the action of one thousand men. Phase 3 isn’t exactly necessary, the product is not meant to be exquisite. 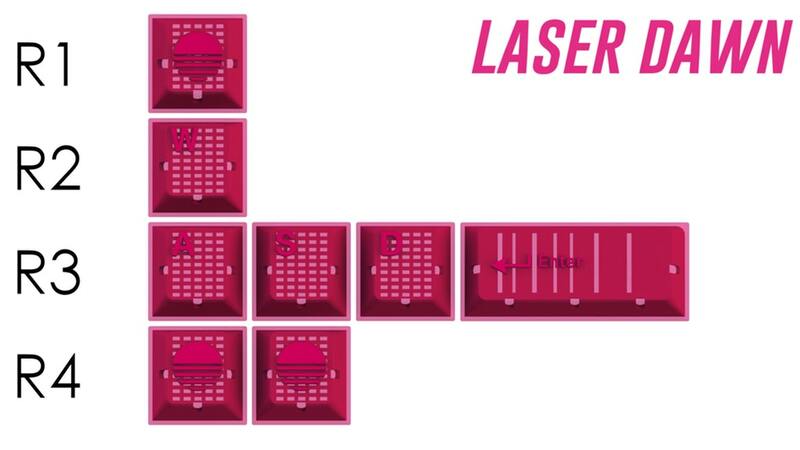 Laserwave GMK keycaps stop at Phase 2 – the ideal design considering what we wanted as final product. The Laserwave GMK kits are the result of our work. Pursuing a new technique for Cherry profile ABS doubleshot mechanical keyboard keycaps, this kit is meant to take the user to a Hands on Deck, The Laser GMK Short Story ride. After several months of prototyping and refining the concept, these kits were conceived and designed pioneering the translucent ABS doubleshot technology from GMK Electronic Design GmbH, in Germany. Instead of making shine through legends, we decided to create shine through keycaps. 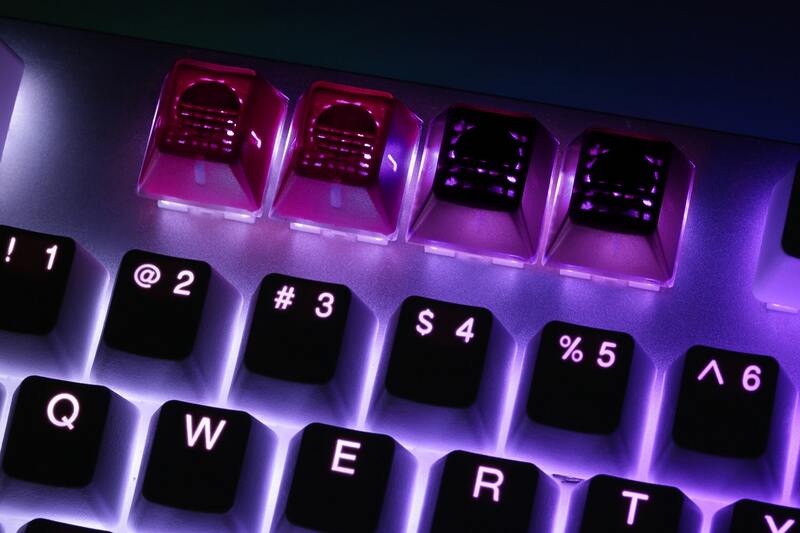 These exclusive kits are manufactured featuring translucent & solid 1.5mm thick ABS thermoplastic polymer keycaps, in Cherry profile, officially color matching Laser GMK and provide a variety of accents in purple and pink for MX mount mechanical keyboards. The kits are backlighting compatible, meaning that the glow will shine through the shell of the keycaps themselves, leaving solid color legends and injection marks behind, for optimal gradients, contrast and aesthetics. 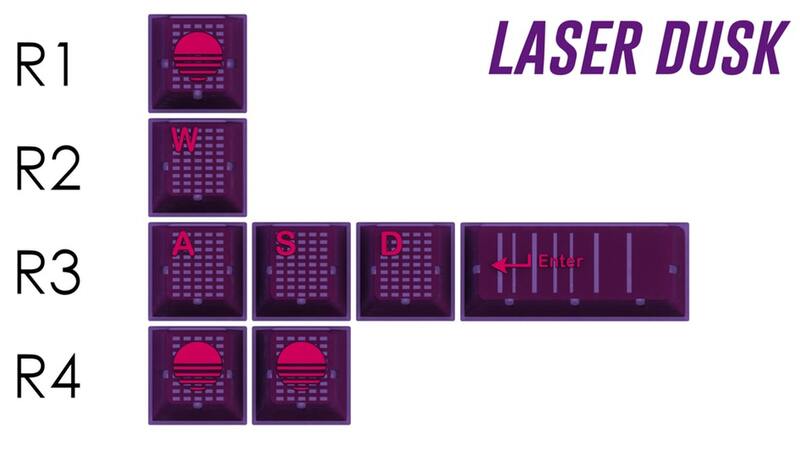 The Laserwave GMK keyset kit is part of the Laser GMK keyset exclusive commissions, trinkets and items. It will debut on Massdrop today, at 6 A.M. Pacific Standard Time. More exciting things coming today, don’t forget to visist the Laser Shoppo! Laserwave GMK – Solid injection on translucent material.